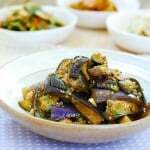 While summer eggplants are still abundant, I wanted to share this very easy but flavorful side dish. Thanks to my container garden, I’ve been enjoying this dish quite a bit this summer. 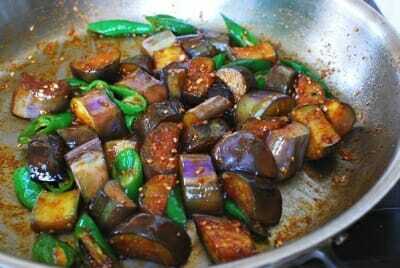 Previously I posted another one of my favorite eggplant recipes called gaji namul, which is a steamed eggplant side dish. 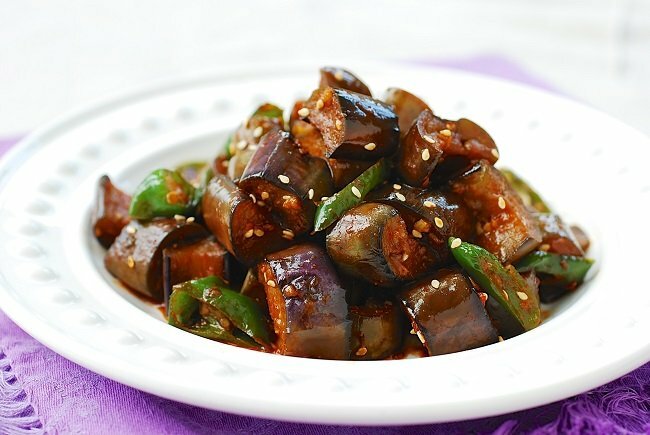 Here, the eggplants are stir fried with simple seasonings, and the gochujang (Korean red pepper paste) adds a nice kick to the tender eggplants. 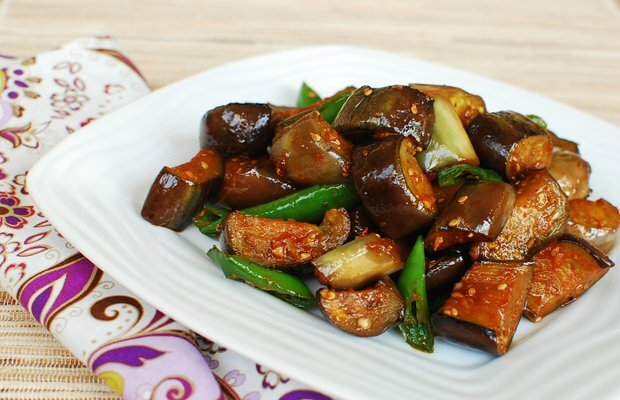 Eggplants are stir fried with simple seasonings! 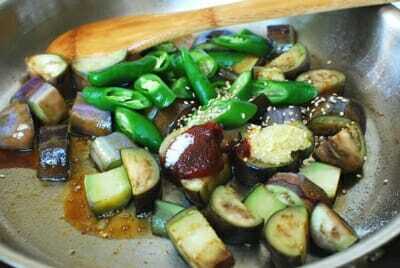 Gochujang (Korean red pepper paste) adds a nice kick to the tender eggplants. 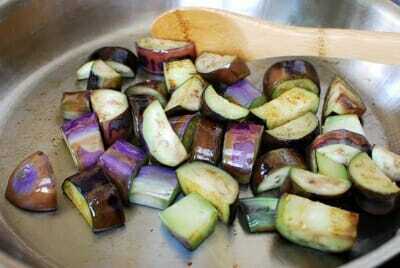 Cut the eggplants lengthwise in halves. Then cut crosswise into about 1/2-inch thick chunks. Cut the pepper into about 1-inch long pieces. Heat a pan with the oil over medium high heat. Stir fry the eggplants quickly, about a minute or until the outside starts to soften. 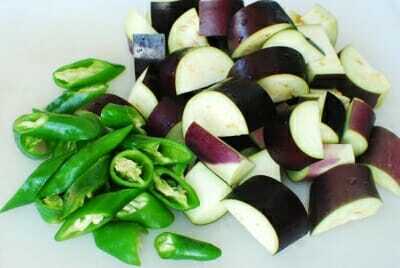 Continue to stir-fry until the eggplants are well coated with the seasonings and the pepper is slightly wilted. Yum, I just made this tonight and it was delicious. My Korean husband loved it too! 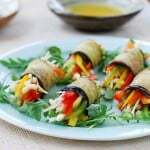 Thanks for posting this great recipe! Anonymous – That’s great! Glad you and your husband liked it. Thanks for taking the time to give me a feedback. This sounds amazing! My husband’s favorite food is eggplant. Can’t wait to give it a try. Thank you, Danielle! Hope you and your husband enjoy it as much as we do. 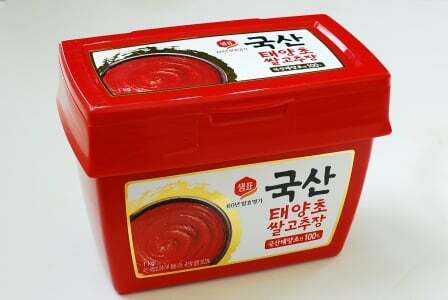 I use Gochujang a lot but this is Japanese brand that I’m not sure if spicy level is same as Korean one, but it works for me since I can’t eat too spicy. I’m going to make this soon!! I can’t add pepper, so either just eggplants or… can I add pork? Or does it make totally wrong dish. =P I’m trying to make it “main” course since my husband needs meat. Heheh. I love eggplant, but I have never grown it. I think I’ll try to grow some next year! 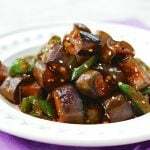 This is one of my favorite ways to eat eggplant! 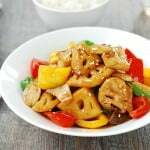 Nami – Of course you can add pork and make it a main dish. The amount of gochujang in this recipe does not make it really spicy, but I am curious how the Japanese brand gochujang is. Thanks for stopping by! Andrea – My eggplants have done pretty well this year even with the extreme heat wave we had this summer. But they seem to do better with lots of water and cooler weather. Thanks for visiting! Thank you, Jane! 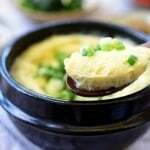 I am sure your mom love those phone calls from you, but I am glad to be part of your learning Korean cooking. we all love eggplants around here and a new cooking idea is always welcomed. Thank you so much! I’m honored. All the featured dishes look great. Hi Ken – I’m so glad to hear it turned out well for you. Great to hear it works well with chips. I should try it. Chopped fennel sounds great too. Nice idea! Thanks for coming by and letting me know!! Cheers! Awesome – another eggplant lover was born! Thanks for the feedback, Emily! Happy Korean cooking! Delicious! 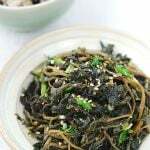 I made this tonight along with the potato pancakes from this site and topped them with purchased bulgogi. So easy and sooooo good. I have tagged all your recipes. I can’t wait to try more. oh that sounds like a great dinner! Thanks for using my recipes! What a wonderful recipe! I made leftovers into a cold salad, with mango, avocado, stir-fried tofu and a little extra korean chili powder. It was a delicious addition to our picnic. 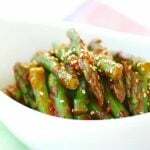 Thank you for sharing your home-cooked Korean recipes! Thank you for this recipe. I made it tonight and my husband and I loved it! Thanks to a miscommunication in the farmer’s market (My Korean really is rubbish, it’s sad to watch…), I have a mess of eggplant here and I’ve never cooked with it before. Love this dish! 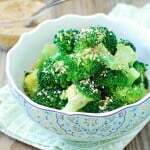 My husband is Korean and it’s not the usual for him but I love it with just rice. No need for meat. That’s great to hear! Hopefully your husband will become a fan of it too. Thank you so much for the feedback! Thank you so much for this recipe! I made it with some Bulgogi and it was a hit! I love eggplant but this takes it to a whole new level. This is definitely going to be my go to recipe from now on. I made this today with some eggplants from the farmers’ market and it was just crazy good! I have been really enjoying your recipes! Would love to see this page with the nice print option that you have on some other recipes! Thanks. Google must have mis-categorized it. There’s no video here. I want to thank you for making this recipe available for people who are not lucky enough to personally know a generous korean cook, ie, me! This has become my family’s favourite way to enjoy eggplant. 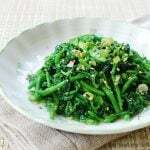 I make several of your recipes at home, but this is the one i make most often! Again, thanks! 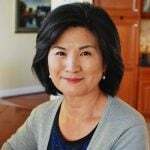 Hi Ouimama! I’m so happy to hear that. I love this dish too.